MyStart is part of ClientConnect LTD which offers other similar websites (Trovi, Conduit, Hiyo). 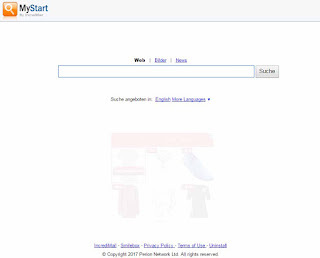 Currently MyStart is a search interface without its own results page. The requests are forwarded to Bing and their result page is displayed. Originally Google was used as a search engine. A separate results page was offered for the web search. The image and news search led directly to Google. After submitting a search query, Google displayed the results page for the query.